* From a contemporary press cutting: ‘On May 7th 1957 Archbishop Heenan presided at Solemn High Mass to mark the formal opening of the Church of the Assumption of Our Lady, Spen Lane. This Church serves area which covers the Hawksworth Estate, Beckett Park, West Park and the new estate at Butcher Hill. This area was declared a Parish in September 1954 and included territory which was taken from three parishes: the Sacred Heart, St Mary’s Horsforth, and St Urban’s. 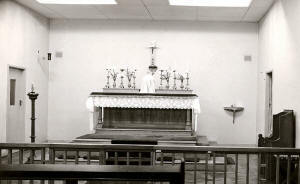 There was neither site, church, house or presbytery, but through the co-operation of a loyal parishioner Mass was able to be said in the Labour Hall, Hawksworth on the first Sunday of the parish’s existence. Within three months a house was purchased at Butcher Hill and the Parish Priest, Fr M P Grace was able to take up residence. In 1955 a second Mass centre was opened at the Dutton Arms, Beckett Park and the attendance had increased from 60 to 120. A large house, Spen Hill, then fell vacant and Fr Grace succeeded in purchasing it. 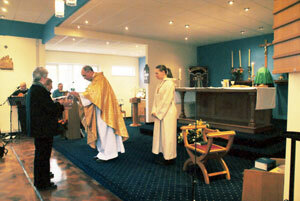 With this home went two acres of land and it became the centre of parish activity immediately. It was then possible to have all church services at Spen Hill and to set about drawing up plans for a church building. The necessary permissions being obtained the first sod was dug on the morning of November 26th, 1956. 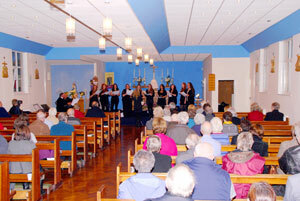 The building was finished in April of this year just in time for the full Holy Week ceremonies. Mass attendance is now 260 and still increasing. 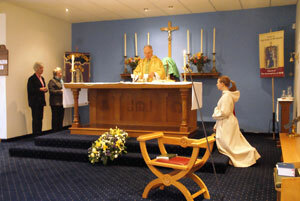 Following are some pictures of the first Mass after completion of a major referbishment carried out in 2012.